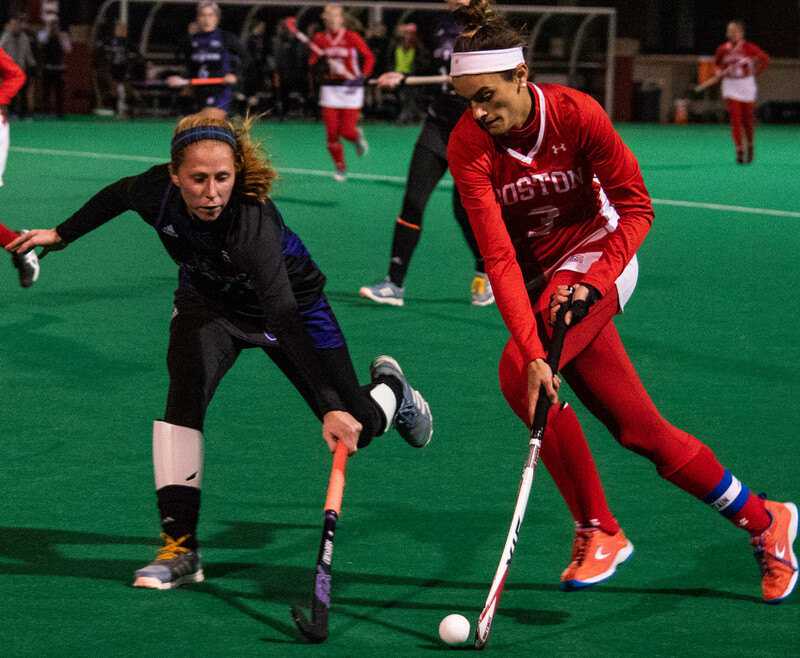 Boston University field hockey went 1-1 to close out its 2018 regular season slate, downing in-conference foe the College of the Holy Cross Friday before losing in Sunday’s match to rival Boston College. The final weekend of the regular season began with the Terriers (10-7, 6-0 Patriot League) coming back to beat Holy Cross (3-14, 2-4 Patriot League) 2-1 on Senior Night to finish with a perfect 6-0 in the Patriot League for the second straight season. BU head coach Sally Starr complimented her team on another undefeated league season, especially with this season’s schedule and the Terriers’ success in overtime. The Crusaders got off to a strong start, taking a 1-0 lead just under six minutes into the match when senior midfielder Emily Loprete scored her 12th goal of the season off a BU turnover. After the goal, the Terriers clamped down defensively, as that Loprete shot on goal would be the last the Crusaders would register on Terrier goalkeeper Kathleen Keegan. BU equalized the score in the 10th minute. Senior forward Kara Enoch was found on a cross from sophomore forward Petra Hall after she showed great speed to track down a long cross. With just over five minutes remaining, senior fullback Ally Hammel gave the Terriers a late lead off a penalty corner. Hammel said she was happy to the score the winning goal, especially for all of the hard work her teammates put into the match and the season. Two days later, the No. 23 Terriers finished off their regular season schedule with a 1-0 loss at No. 17 Boston College (10-8). An aggressive attack from the Eagles characterized much of the first half, with BU needing to focus much of its efforts on defense. Keegan continued her strength in the cage for the Terriers, saving three shots in the first period and six over the course of the game. Meanwhile, BU could not generate offense in the first half, forcing just two shots compared to BC’s five. The Eagles broke through with the game’s first and only goal in the 42nd minute. The score came courtesy of a strike from freshman fullback Eva Van de Mierop after a penalty corner. Senior midfielders Frederique Haverhals and Ymke Rose Gote were each credited with assists. The goal was Van De Mierop’s first of the season and first of the freshman’s collegiate career. The Terriers made a few runs late in a bid to tie the game but failed to cage any shots. One quality chance coming off a corner in the 64th minute was stopped by a diving save from BC goalkeeper Jonna Kennedy. The freshman notched two saves in the contest. Only one Terrier was able to create more than one shot attempt with Hammel shooting twice. With the regular season behind them, BU will now look ahead to the Patriot League postseason. As the top seed, the Terriers will host the playoffs, marking the fourth straight year the tournament has been held at New Balance Field. The squad’s first game will be against the Leopards of Lafayette College. BU handled the Leopards in their last matchup, prevailing by a score of 7-4. Starr spoke to the recent success of the team, commending the team’s senior class members — Hammel, Enoch, Keegan, Allie Doggett and Maika Akroyd — who won the regular season title in every year of their Terrier careers.